This is section 1 of that book which includes the Preface and Chapters 1-3 along with those chapter references. The Preface explains how and why this book came out. 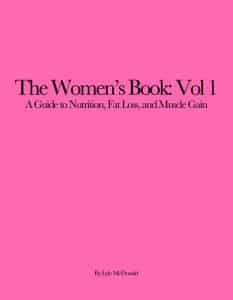 Chapter 1 is an Introduction to Women’s Physiology looking at a number of topics ranging from the general lack of women in research traditionally as well as an overview of differences between women and men that make it critical to treat women as more than “just little men” when it comes to nutrition, dieting, fat loss or eating for muscle gain. Chapter 2 is a length overview of the menstrual cycle. This includes a detailed look at its overall structure along with the major overlapping changes which occur in both estrogen and progesterone. I look at the effect these changes have on a woman’s physiology as this sets the basis for many if the dietary and supplement recommendations I make later in the book. The impact of other hormones such as testosterone, insulin, growth hormone and others is also discussed. Finally is Chapter 3 which discusses what I call hormonal modifiers. This covers a myriad of sections that alters or modifies the menstrual cycle. I briefly address amenorrhea (the loss of the menstrual cycle, discussed in detail in another section) and oligomenorrhea (infrequent cycles) with the latter leading into a discussion of hyperandrogenic states in women. The most common one of these is Poly-Cystic Ovary Syndrome (PCOS) and I detail the change that can occur here. A detailed discussion of hormonal birth control (including the pill, patch, shot, implant, intravaginal ring and hormonal IUD) follows. This includes a discussion of the potential impact of hormonal birth control on bodyweight and body fat levels. The chapter ends with a look at the changes that occur with age in terms of peri-menopause along with the menopausal transition. I also address the differences between women who choose to use hormone replacement therapy (HRT) versus those that do not. Bio-identical hormones are briefly discussed. The first 3 chapters of The Women’s Book Vol 1 set the background for essentially all of the information to follow as, throughout the book, I try to look at all topics through the lens of not only the premenopausal cycling woman but women who may have one of the hormonal modifiers. The Women’s Book: Volume 1 Section 1 can be purchased for $4.99 on the Amazon Kindle Store.